Whether you’re looking for a quick pick-me-up, to blow off some steam or organise the best games’ night ever, it’s probably time to go bowling. Head to these alleys in Gurgaon for a round of lane bowling, your favourite arcade games, beer and and a really fun evening! BluO has been a crowd favourite for a few years now. Their world-class bowling alley continues to attract amateurs, as well as more seasoned pros. If you’re not quite ready to hit the lanes, there’s always karaoke on offer. However, BluO’s biggest draw remains the bowling experience and heaps of nostalgia! An old-school gaming arcade that has centres all over India, Amoeba is super affordable, kid-friendly and has been around for ages. In addition to a four-lane bowling alley, they have indoor rides, air hockey, league dart machines, Foosball and pool tables. Smaaash promises an interactive entertainment experience. 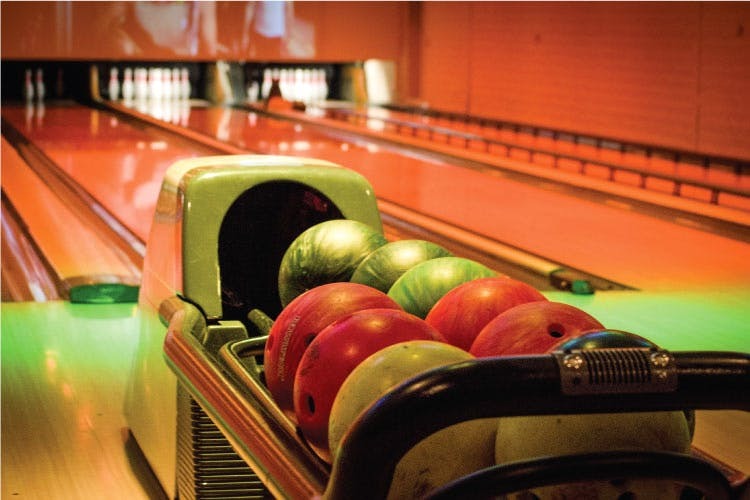 Open in DLF CyberHub, the gaming centre comes equipped with a UV-lit bowling alley, which sounds awesome. However, their Oculus-Rift enhanced immersive games are definitely worth checking out. We’ve heard good things about vertigo-inducing Walk The Plank and Finger Coaster. Make sure to ask about the deals on offer, there’s lots of free beer to be guzzled!